This is another card for Administrative Professionals Day. For this one, I embossed my white cardstock using an embossing folder (Stylized Flowers by Provo Craft), then used reinkers and a blender pen to color the raised embossing. Supplies: Stamps – JustRite, paper – Papertrey Ink White, Stampin’ Up! 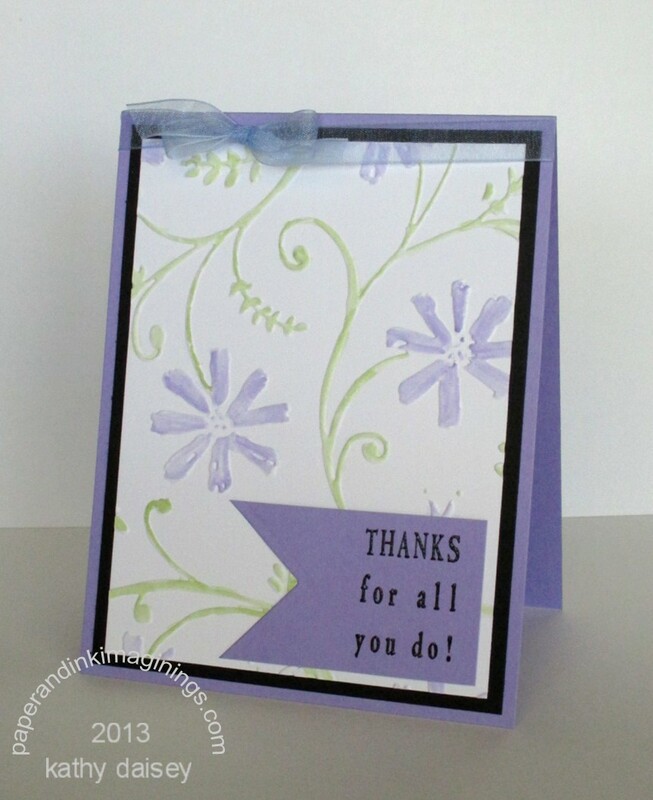 Basic Black, Lavender Lace (retired), ink: Stampin’ Up! Certainly Celery, Lavender Lace (retired), VersaFine Onyx Black, embossing folder – Provo Craft, embossing powder – Filigree Fine Art Powder clear, organdy ribbon – JoAnn’s. 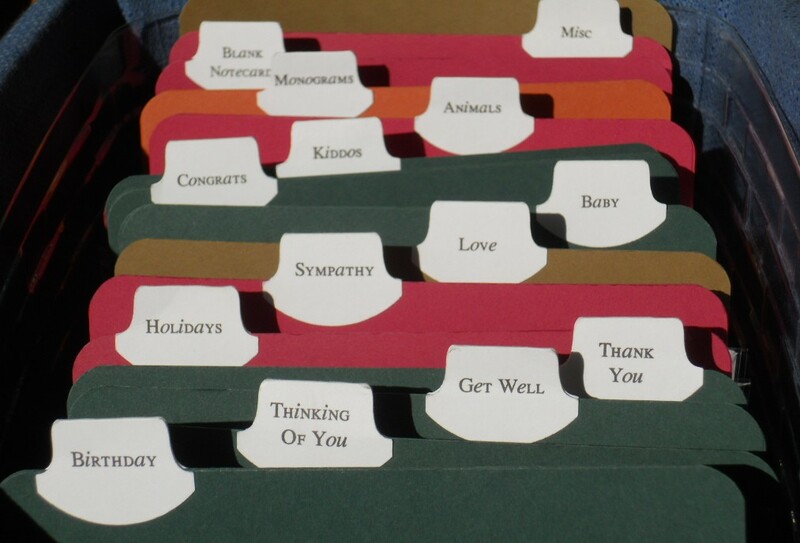 Categories: business, card, caring | Tags: card, JustRite, Papertrey Ink, Provo Craft, Stampin' Up! | Permalink. Someone asked me to make a few Administrative Professionals Day cards. (I had to look at the calendar to make sure I met my deadline!) This year, Administrative Professionals Day is Wednesday, April 24th. Supplies: Stamps: JustRite, Stampin’ Up!, paper – Papertrey Ink White, Stampin’ Up! designer paper (retired), Certainly Celery, ink – VersaFine Onyx Black, dies – Papertrey Ink, Spellbinders, Stampin’ Up!, embossing folder – Provo Craft, embossing powder – Filigree Fine Art Powder Clear, organdy ribbon – JoAnn’s. 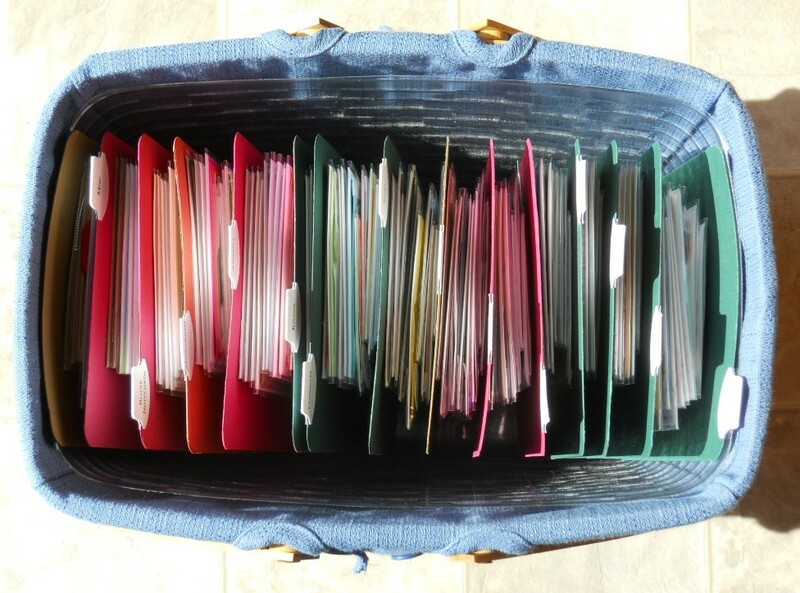 Categories: business, card | Tags: card, JustRite, Papertrey Ink, Provo Craft, Spellbinders, Stampin' Up! | Permalink. First, thanks for the comments on my post “Trio of Flower Cards”. I put the names of the four readers who commented into a hat (really a pint carryout container from our favorite Chinese restaurant), and Amber R. won the cards! I will e-mail you privately for your mailing address. Thanks for participating in my first giveaway! I am a bit under the weather. I spent yesterday on the couch, not at my craft table. No creating whatsoever. 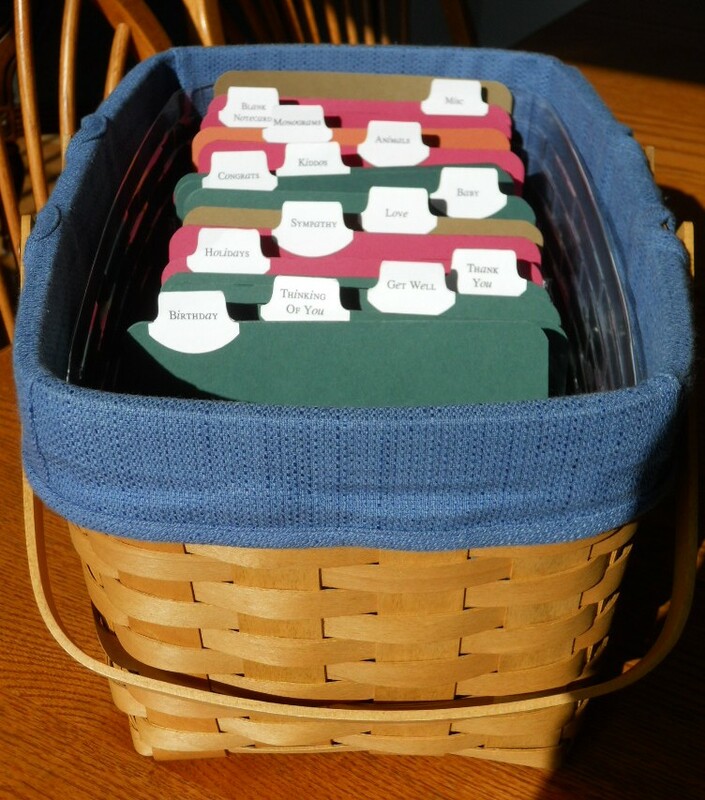 So, in the absence of a card or food post, I thought I would introduce you to my card basket. It is a Longaberger Medium Market Basket. I try to keep my card inventory above 100 cards. Since I have been trying to create every day for the blog, my inventory is above 130 cards, and the basket looks ready to burst. I take the basket with me when I go to volunteer at school, or when I go to a medical or dental appointment. The teachers, technicians and assistants do enjoy browsing. Categories: business, thoughts | Tags: card | Permalink. My good friend has a business called Interior Touches. She makes custom window treatments, all sorts of custom sewing projects for a home. Her work is beautiful! Several years ago we created this thank you note for her business. She sends them to her customers to thank them for their business or for referring a new customer. Do you get thank you notes/letters from the companies that you do business with? I do remember getting a thank you letter from the roofing company last fall. And I know my appliance repair company sends me a new coupon after every visit as a thank you. My blog isn’t really a business, but THANK YOU for looking at my blog! I appreciate the clicks! Supplies: Stamps – Stampin’ Up!, paper – Stampin’ Up! Brocade Blue (retired), Mellow Moss (retired), Very Vanilla, Whisper White, ink – Stampin’ Up! Basic Black, Brocade Blue (retired), Mellow Moss (retired), computer generated text (business name), gold & silver mini brads, foam tape, corrugating tool. Categories: business, card, thanks | Tags: business, Stampin' Up!, thank you | Permalink.